30.12.2010 Masroor Monolithic Rock cut temples, dating back to the 8th century is a little known world heritage site. The day was heavily overcast when we set off for Masroor, about 40 kms from Kangra on the Nagrota Suriyan Link road. The road to the temples is in pretty good condition ; espied several green signboards (ASI) marking the route to Masroor. A gorgeous vista of hewn rocks met our eyes, leaving us awed with its magnificence. We were once again amazed at the fascinating nugget of history and architecture tucked away in Himachal Pradesh. 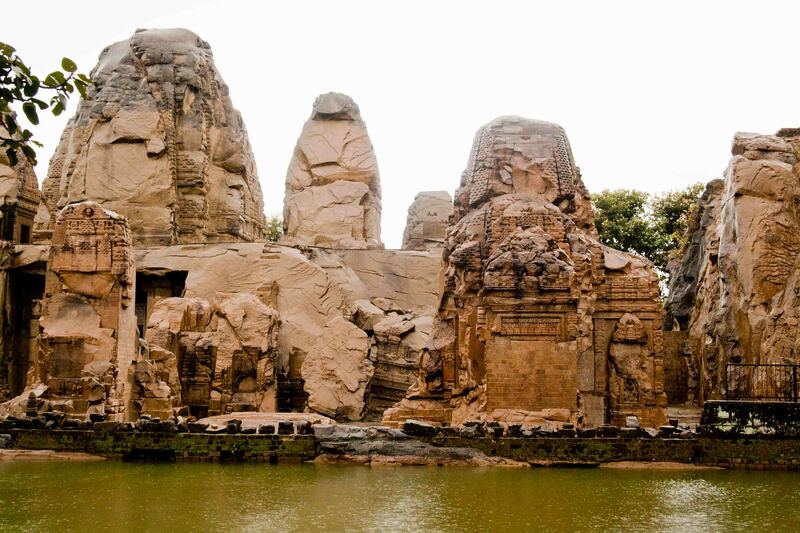 Though not such a big place, the entire structure is huge and towering; constructed alongside a rectangular pool of water and surrounded by the majestic Dhauladhar trees. The temples stood out tall and straight, in one line; we could make out Buddha and Ganesh faces cut in the rock face here and there. 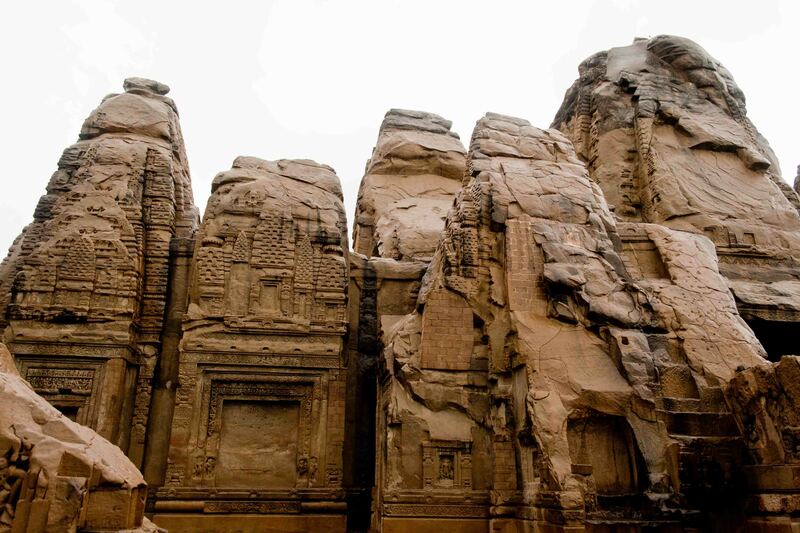 The temples (15 in all) are carved out of monolithic rocks by the artisans by hand in the Indo-Aryan style. 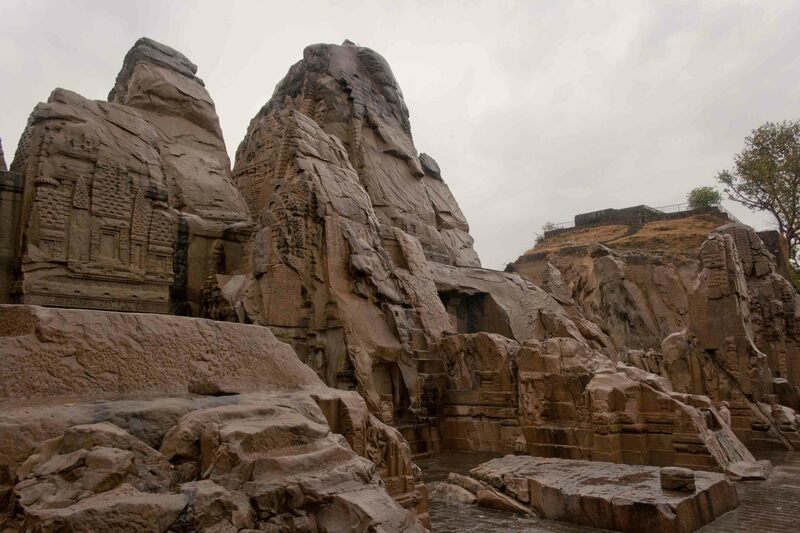 The entire structure is constructed on top of a 2500 feet high hillock. 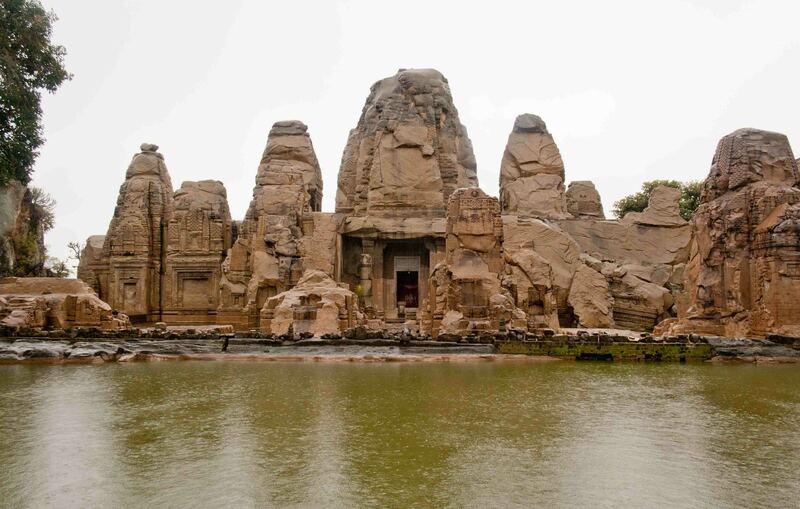 All the temples are in continuity and built around a central shrine, which dominates the center and has three stone images of Ram, Laxman and Sita. These deities were decorated with colored cloths and we could make out that people come out here to pay their reverence as in any local temple. 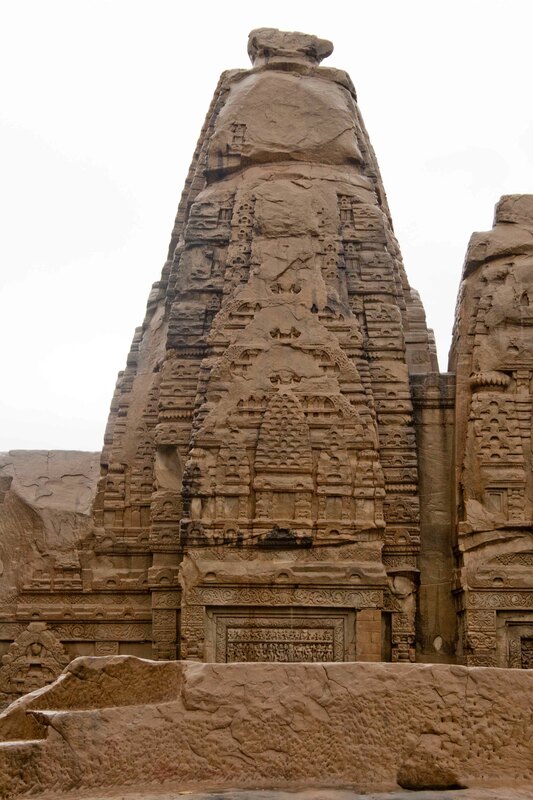 The shikara of some of the temples remain standing and are a supreme display of the craftsmen of the 7th -8th century who overcame the limitations of the existing rock structures to shape and carve their creations. 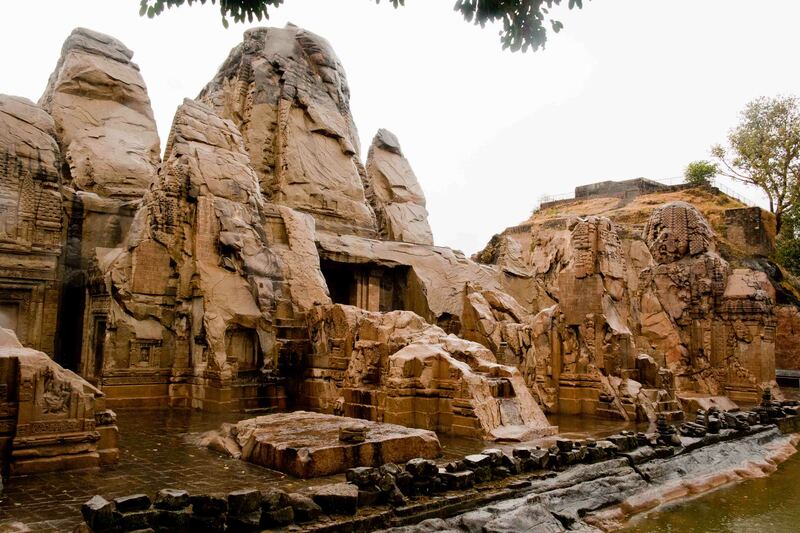 These richly carved cave temples are the only rock shrines of their kind in North of India. Another example of rock-cut temples in India are the Ajanta-Ellora caves. The earthquake of 1905 devastated some of the beauty of this gorgeous piece of architecture, leading to the ASI removing several of the carved panels to the Shimla museum for preservation and display. The place had an air of neglect; the signboards were rusting, paint was peeling, writing was fading – difficult to read and make out what was written there. The ticket counter was also bereft; one soul came out of nowhere to issue us the tickets. There was a small chai Walla shop next to the pool of water; other than there is nothing else around here. If not for the pouring rain and chilling winds, we would have probably spent some more time here to revel in this gorgeous chapter of history. Thanks to the stinging rains, I couldn’t take as many pictures as I would have liked to. 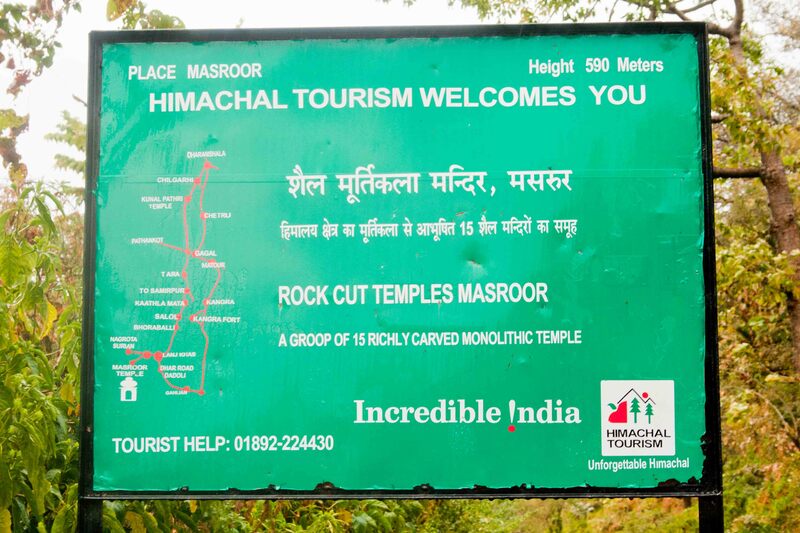 Thanks Yadwinder – yes its indeed a very gorgeous site to visit!! It’s looks such a splendid place. Your posts are giving me the desire to explore the incredible India. Thanks so much Z – I am so in love with India. Thats why my preferred place of travel is always somewhere in India! Have so many travel tales tucked away for more telling!! Thanks so much Keerthi- this place is simply stunning!! Previous Post Travel Diaries: Kangra Fort – Himachal!